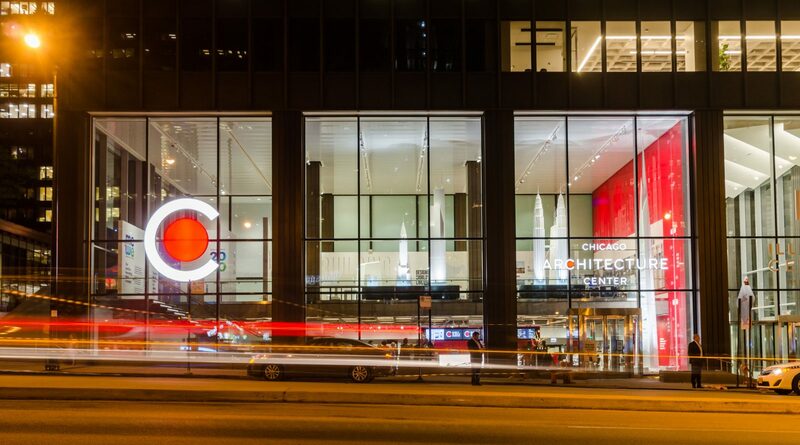 The new Chicago Architecture Center opened August 31, 2018. Gallagher & Associates worked hand-in-hand with the Chicago Architecture Center to develop a world-class destination and gateway for tourists, architecture-enthusiasts, practitioners, and students to discover the marvel that is Chicago’s architectural landscape and legacy. In less than nine months from project launch to open, G&A worked closely with the CAC to interpret Chicago’s architectural legacy into a visitor experience that is both awe-inspiring and accessible. “The experience we designed illustrates how architecture becomes the urban canvas for daily life, providing a new lens for audiences to explore the city and its unique architectural fabric,” says Cybelle Jones, Principal and Executive Director, Gallagher & Associates. To tell the story of Chicago architecture, we divided the experience into two primary galleries: the downstairs “Chicago” gallery, tells the story of how Chicago came to be the city of architecture; while the upstairs “Building Tall” gallery, studies the evolution and innovation of skyscraper design and technology through the lens of Chicago’s famous architects and their influence on buildings throughout the world. 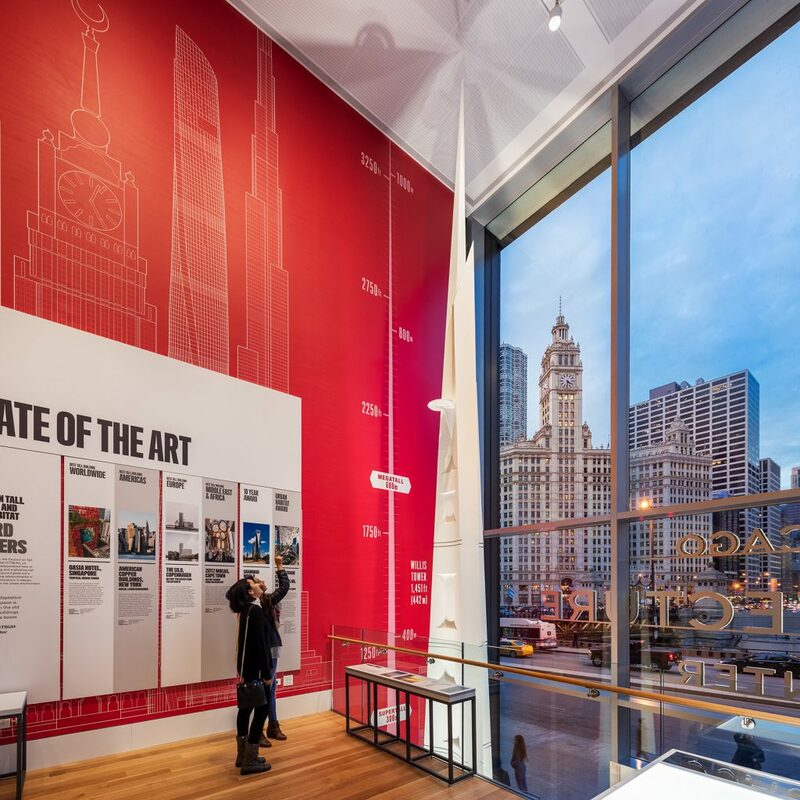 “We were challenged to create a powerful exhibit that matched not only the scale of the Mies van der Rohe lobby but also the imposing Chicago skyline outside,” recounts Jamie Rains, Senior Exhibit Designer. Large-scale models of the world’s most iconic skyscrapers were expertly arranged within viewing distance of the windows—thus, adding visual interest from across the street, while inside the center, they evoke a sense of awe and wonder. Using a consistent scale allows visitors to gain perspective. “Being able to compare the first skyscraper at a little more than 1 foot, to the future tallest at more than 36 feet, evokes a visceral reaction that we couldn’t achieve otherwise,” notes Christian Cabrera, Senior Graphic Designer. A bold, yet simple, typeface mimics the height of different buildings, while the restricted color palette compliments CAC’s identity. These bold, yet simple, graphics are carried throughout the Center, adding gravity to the pure white models, yet not competing with them as the main attraction. Chicago is a “City of Neighborhoods,” defined by people, planning, and zoning that are ever-changing. As communities and economic priorities shift, they leave an imprint on buildings and landscapes; if one looks closely, it is possible to “see” a neighborhood’s history in its architecture. The places highlighted here provide windows into the story of Chicago and onto issues faced by neighborhoods in cities around the country. Visitors can stay and engage with the model to explore Chicago neighborhoods, landscapes, and buildings through an interactive kiosk, developed by the European-based company, 401. As visitors explore, projection mapping on the model—designed by G&A—augments the experience. There are so many ways that Chicago architecture has shaped the lives of people throughout the world; and with the new center, we’re proud to help focus the lens through which people understand how Chicago became the City of Architecture.